Construction is set to finally begin this spring to turn an abandoned water-bottling plant into headquarters for Manhattan-based 212 Brewing Co. in Delaware County. “Growing our own grains and hops is still down the road a bit, but we are looking to have this brewery up and running by this fall,” founder and CEO Don Trooien tells Catskill Eats. With assistance from the county’s Industrial Development Agency, which is helping finance the project, Trooien is converting the former Wissahickon Mountain Spring Water plant into production facilities for his three-year-old brand. The 20,000 square foot factory just off Route 23 has been cleared out, and the upfit is scheduled to begin in March or April. The brewery is expected to eventually churn out 50,000 to 70,000 barrels of beer annually, using as its main ingredient the ample supply of spring water that flows through the 16-acre property. 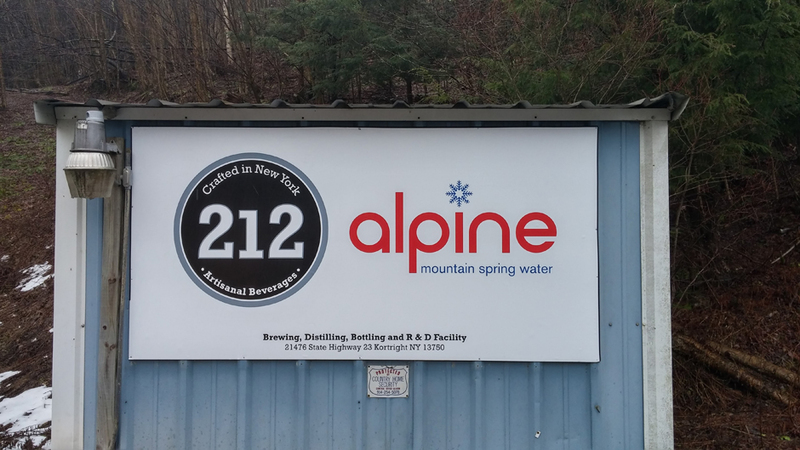 Alpine Mountain Spring Water may also be bottled there, Trooien said, but that water would be sourced in Utica, since 212 Brewing is expected to consume the available supply on site. Contracting with other breweries in upstate New York, 212 Brewing Co. currently produces two beers: an American pale ale called Flatiron Ale, and the just-released South Street Seaport IPA. A double IPA and a stout are under development. The beers are distributed to 125 venues in New York City, including Yankee Stadium and upscale restaurants such as 21 Club. The brand has recently expanded to a few locations in Vermont’s ski areas, and this spring Trooien expects to be serving his beers in Connecticut, Massachusetts and New Jersey, as well. Sometime in the next few weeks, Catskills residents will also have a chance to sample 212 products: The Bull & Garland, a new English pub-style restaurant and bar in Hobart, will be adding one to their draft line soon, Trooien said. As far as other ingredients go, Trooien’s long-range plan is to grow his own grains and hops at the converted 250-acre horse farm he owns next door to the brewery property. Agricultural suppliers are struggling to keep up with the demand from upstate New York’s blossoming brewery scene, so growing as many of its own ingredients as possible will allow 212 Brewing to control its supply chain, Trooien said. Known as the Stone Cottage Farm, the adjacent property includes a modernized 1790s-era farmhouse, a 6,000-square-foot barn and a guest house. The original plan, which Trooien detailed for Catskill Eats about a year ago, called for the farmhouse to host a tasting room and restaurant. As plans have evolved, however, it’s now looking like the tasting room will be incorporated into the brewhouse, while the farmhouse could be used for special events, he said. If all goes according to plan, 212 Brewing Co. will join several new Catskills breweries now under construction. In Greene County, West Kill Brewing is slated to open in late spring or early summer, while the Athens-born Crossroads Brewing Co. is expanding to new digs in the town of Catskill, in a former newspaper printing plant. In Sullivan County, a new project from a team that includes one of the founding partners of Catskill Brewery is seeking approvals to build a new brewery, tasting room and eatery called Upward Brewing Company in Livingston Manor, on 120 acres just off County Road 149. In Ulster County, Gardiner Brewing Co. is in the process of converting a barn to a brewhouse and applying for a farm brewery license.